Thursday September 13, 2018 – The Independent Electoral and Boundaries Commission (IEBC) Chairman has thanked his commission for doing a great job in last year’s election in which President Uhuru Kenyatta beat NASA leader, Raila Odinga, for President. Speaking yesterday, Chebukati told a post-poll evaluation forum that the agency had done a good job with regards to the 2017 polls despite the Supreme Court nullifying Uhuru’s win against Raila and sending them to the ballot. 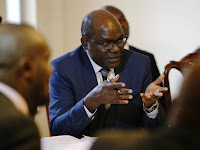 “Out of the 14,523 candidates we had, only 25 of the 300 that were dissatisfied with the way we conducted the polls succeeded in the courts,” said Chebukati at the Sarova Panafric Hotel, where the IEBC is holding a two-day national post-election evaluation meeting. A total of 388 petitions were filed in courts after the election, most of them given traction by the historic decision by the Supreme Court to invalidate the re-election of President Uhuru Kenyatta citing illegalities and irregularities.